b) post cheque made payable to “Come in Sucker” for $5,000 to "The Scribe". Or: 2. Turn up at advertised arrival time listed in “Ride Calendar and Bullsheets” with your trusty treadley, resplendent in cycle clobber, with a smile on your dial, and enough dosh to cover your cakes 'n caffeine at Nosh Stops, ready to conquer a few hills. e-mail Bank Teller ScribePJ@bigpond.com to put your e-mail address in the weekly 'group broadcast reminder e-mail' which Bank Teller transmits mid-week summarising the following Sunday ride and raps-up last Sunday's ride. Muggaccinos' 1st Commandment is "Hills are your friends* and mountains are your mates." Fortuitously, the perimeter of the Greater Sydney provides lots of beaut steep climbs, and there are few things more satisfying than conquering, with your mates, another marvelous climb. Prima facie, climbing steep hills on a bicycle may seem difficult. However, with ultra light bikes and very low gears, the strain to climb a steep hill is no different than cycling fast on flat roads. Mass production in China of 50% circa of all high grade bicycle frames (steel, aluminium, carbon fibre, titanium) now sold, has evidenced bicycles reduce by approx 50% in real terms over the last 12 years, rendering them available to most Australians. A competitive bicycle costs as little as AUD$1,200 new, albeit one can pay +AUD$9,000 for a top line bicycle. Alas, too many bike shops sell you what is on their shop room floor rather than what will enable you to climb the +60 brill KOM Climbs in Greater Sydney and the Illawarra which are set out in KOMpm.com. (iii) replacing your front 39T small chain ring if it has travelled +20,000km with a 38T chain ring ($15). Several of Muggs' stalwarts can advise you re the optimum solution if you want lower gearing, and where to get the best bargains. 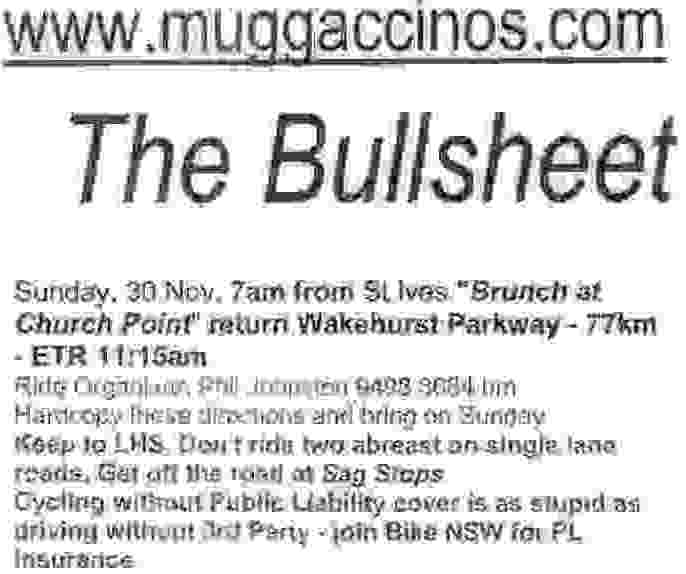 All cyclists are welcome to join Muggaccinos’ Sunday rides provided they are comfortable cycling over 50km on public roads. If you are not yet confident cycling >50km, let us know and one or two of us will arrange to meet you on a Saturday for a shorter ride, say from Berowra to Pie in the Sky, Nth Cowan 'n back, to assess your progression rate. Read "Tips for new road cyclists who want to ride with Muggaccinos". If you want to get into recreational road cycling with the goal to be riding Muggs' 100km circa rides within a few months, we will help you complete that goal. general concurrence with Muggs' "Ten Commandments"